The Forbes Funds provides capacity building to nonprofits in Allegheny County through grants, technical assistance, education, and other special initiatives. Their goal: to help guide not-for-profit agencies through challenging times, as well as the disruptive forces that present opportunities for growth. Performance Associates facilitated process reengineering projects for three participant non-profits: Jeremiah’s Place, Center for Contemporary Craft and Veterans Leadership Program of Western Pennsylvania. 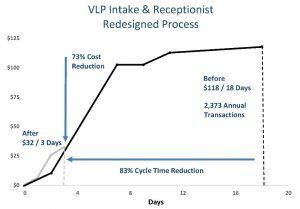 The reengineering effort analyzed both the intake and receptionist activity and processes. The redesigned processes centralized the in-bound calls to the Pittsburgh office, reconfigured the phone system with call attendant functionality, expanded receptionist and intake specialists’ roles to process all intakes, and automated referral processing on the website and EHR system. VLP implemented these recommendations within three months and realized a six-digit direct cost savings. The Annual Studio Workshop Process comprised three seasonal catalogue direct mail campaigns to promote attendance for more than100 artist-led workshops. The process analyses provided clear direction on the goal for a dramatic increase in workshop attendance. The reengineered process created a streamlined workflow, enhanced print and digital marketing campaigns, restructured workshop offerings and more aggressive promotion. We anticipate a 50+% increase in student attendance. Annual employee turnover at Jeremiah’s Place averages 30% which requires the organization to conduct six hiring cycles each year. The reengineered process created a career path for university students to gain behavioral health and social service work experience at Jeremiah’s Place while working on their degrees. Relationships at the local universities and behavioral health agencies provide a stepping stone from the universities directly into behavioral health careers. We anticipate a 50% reduction in student turnover.